There are three basic areas of training for a service dog: manners, obedience with proofing (ADI public access skills), and task training. This training typically takes 18-24 months. While a pet may be taken for a walk to toilet, a service dog must be prepared to toilet on command, on any surface. A friendly pet greeting visitors to the home may be cute, but a service dog must ignore everyone but his owner. That means he must ignore them when they call to him or offer him food. He must ignore food he finds on the floor, and food that falls right next to him, as well as food that is left unguarded right at eye-level. A pet might be asked to lie down and praised for doing it for a whole minute. A competition obedience dog is expected to do it for five minutes, even when the owner leaves the room. A service dog, on the other hand, may be called upon to hold a down stay for up to four hours at a time. 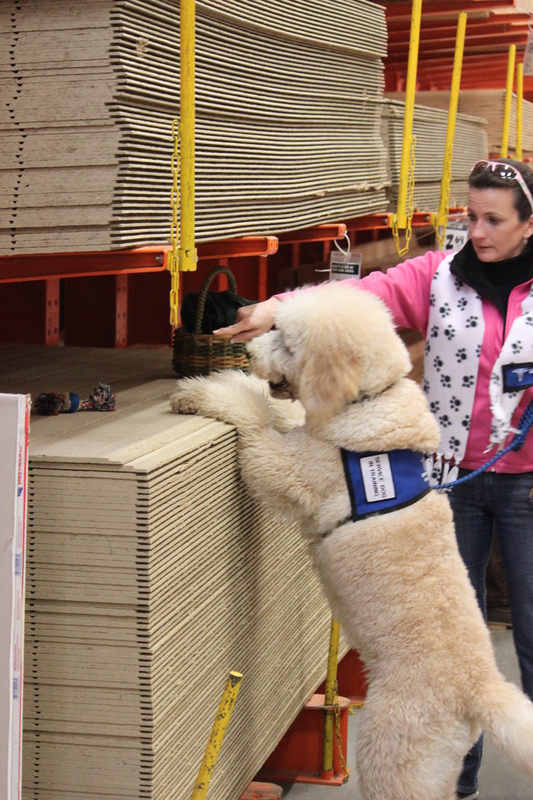 Organizations such as Assistance Dogs International and the International Association of Assistance Dog Partners require a minimum of 120 hours of training for each dog trained by a member or member organization. Remember that this is a minimum and reflects the amount of training required of an experienced trainer to produce results and does not reflect the amount of training it would take a first time service dog trainer to achieve the same or similar results. MSSD requires a minimum of 120 hours and a response rate of 95%. “Heeling,” which, contrary to popular believe does not mean “let’s go,” is probably the most difficult thing to teach a dog. For them it is an abstract concept, to maintain a relative position to the handler, regardless of how the handler might move. It is as much an exercise in attention as anything else. If the handler moves forward, the dog also moves forward, maintaining his position relative to the handler’s hip or the wheel of his chair. If the handler steps back, the dog also steps back, still aligned with his handler. When the handler turns, the dog also turns: automatically. No additional commands are given to direct the dog once he is instructed to remain in heel position. Sir Duke doing an "Up Get"
“Proofing,” is the most time consuming part of training a working dog like a service dog. It means patiently inoculating a dog against distractions, one distraction at a time. Proofing is usually started with the dog in a sit-, down-, or stand-stay, and then progresses to distractions while heeling and during recalls. Distractions may start out as mild as clapping one’s hands and progress until the dog will remain on command even while other dogs are playing around him or fighting, while a squirrel or cat dashes by, while bystanders offer food and call to him, and when his leash is dropped, all at the same time. A service dog is of no real use to his partner if he cannot be relied upon to resist distractions. Wes with his dog Roxy! “Task training,” again contrary to popular belief, is the easiest part of training a service dog. Once he has a firm foundation in core skills, heeling/attention, and proofing, putting together trained tasks is as easy as teaching a dog a neat trick. At their core that’s what tasks really are, from a training stand-point. That’s why task training is the test of whether a dog is actually a trained service dog. If the trainer hasn’t been able to teach the dog legitimate tasks, then that means the owner probably hasn’t got the basic training skills needed to adequately prepare him for obedience and public access either.